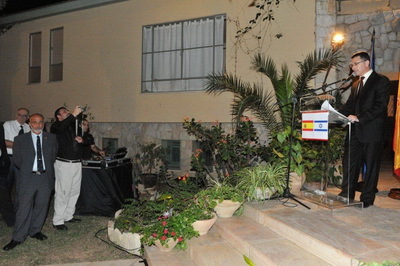 Ambassador of Spain in Israel, Mr. Alvaro Iranzo hosted the celebration of Spain's National Day at his residence in Hertzliya. The guests were received by the Ambassador, Mr. Iranzo, and a long line of cultural and military attaches, counselors, secretaries and other members of the Spanish Mission in Israel. The event started with the Ambassador's speech. His Excellency welcomed those in attendance in both Hebrew and Spanish. Among the distinguished guests were Israel's fifth president, Mr. Izhak Navon and Prof. Ben Zion Netanyahu, father of Prime Minister, Binyamin Netanyahu. Ambassador Iranzo said that Spain was celebrating the discovery of America, an event that made Spain a global actor with great responsibilities. Mr. Iranzo added that Spain is no longer a superpower but history has rewarded the country with the crown of world soccer champions. 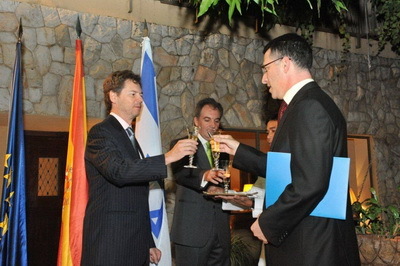 Ambassador Iranzo mentioned that Spain has promoted Europe's relations with Israel, as the president of the European Union in the first half of 2010. He spoke of the official visits of Foreign Minister Avigdor Liberman and Defense Minister Ehud Barak to Spain as well as the frequent visits of Miguel Angel Moratinos to Israel. Ambassador Iranzo spoke of the growing cooperation between Israel and Spain and mentioned that the two countries had signed agreements to increase collaboration in all fields. At the end of his speech, Mr. Iranzo raised a toast to the occasion and invited Minister of Education, Mr. Gideon Sa'ar, to carry his words. Minister of Education, Mr. Gideon Sa'ar first congratulated the Ambassador, the present and all of Spain for their national day and the achievement of winning the world cup last June. 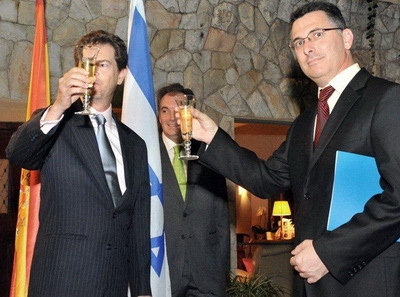 Mr. Sa'ar said that next year, Israel and Spain will celebrate 25 years of diplomatic relations and added that every passing year only increases the bond between the two nations. He emphasized that Spain stood alongside Israel as the president of the European Union and contributed to strengthen the relationship of Israel with EU itself. 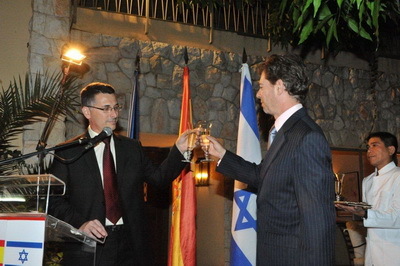 At the end of his speech, Mr. Sa'ar also proposed to raise a glass to Spain and to the relationship between the two countries. After the speeches, Ambassador Iranzo had the honor of awarding four Israeli citizens the Order of Civil Merit, on behalf of the King of Spain, His Majesty Juan Carlos. The recipients were Nira Toledano, Dani Karavan, Jose Benarroch and Micha Harish. 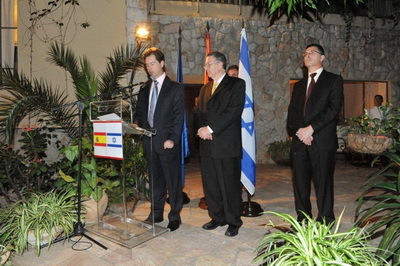 The Decoration was awarded for the distinguished contributions of the four to the relations between Israel and Spain. 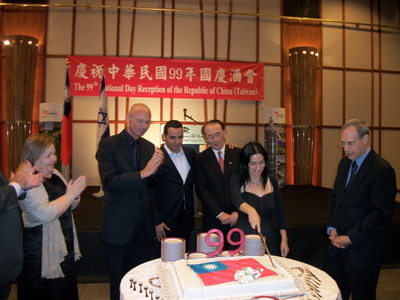 A crowd of Diplomats, Knesset members, business executives and others gathered to celebrate The Republic of China's (Taiwan) 99th National Day. Representative Mr. Liang-Jen Chang received the guests in the Conventions Hall at the Dan Panorama hotel, Tel-Aviv. Many Taiwanese companies exhibited their products to the attendees, such as Kymco and Asus. After the reception, Representative Mr. Chang addressed the crowd and welcomed them to the 99th anniversary of the founding of The Republic of China (Taiwan). His speech started with explaining the new foreign policy mapped out by President of Taiwan, Mr. Ying-jeou Ma. This policy calls for an end to the conflict with Beijing and more flexible diplomacy. Mr. Chang mentioned that in June 2010, Taiwan and mainland China signed a historical agreement for economic cooperation (ECFA). 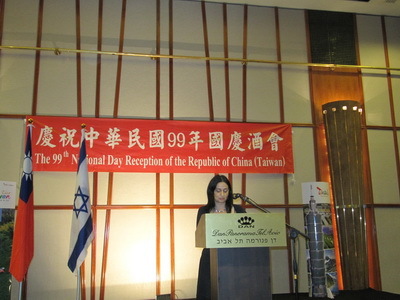 Representative Chang stated that the trade between Taiwan and Israel would reach a volume of $1.3 billion USD. However, he added that there is much more room for improvement in these areas. Mr. Chang praised Israeli and Taiwanese cooperation in the areas of water technologies and youth affairs. After the speech, Knesset member, Dr. Nachman Shai, chairman of the Israel-Taiwan friendship group, was invited on stage. 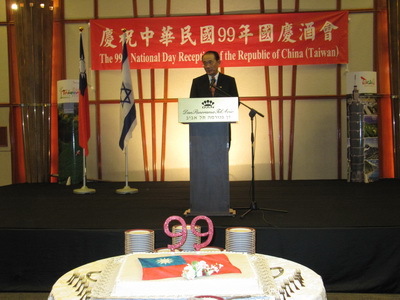 Dr. Shai congratulated the republic of China on their 99th national day. As the chairman of the Israel/Taiwan Friendship Group, Dr. Shai declared that the importance of the relationship between the state of Israel and The Republic of China is flourishing and joined the hope shared by Mr. Chang to create a stronger bond between the countries. 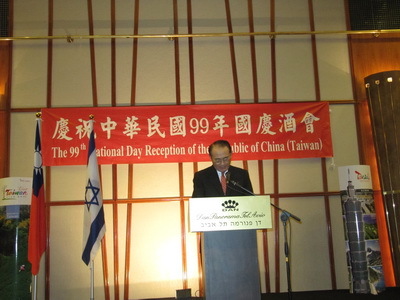 Dr. Shai ended his speech by raising his glass to the continuation of the solid friendship between Taiwan and Israel. The following speaker was Knesset member Ms. Orit Noked, Deputy Minister of Industry, Trade and Labor. Ms. Noked spoke of Taiwan's great economic abilities and the country's similarity to Israel. Ms. Noked said that the many virtues of the people of Taiwan allow them to be one of the strongest economic powers in the far east region. The crowd also had the privilege of hearing about the experiences of Mrs. Maya Cohen, an Israeli student who got a scholarship to study in Taiwan. After the speeches, the guests were free to enjoy the fine oriental style food. Many of the Israeli media was invited to the press conference at the residence of the People's Republic of China Ambassador in Sunday, September the 15th, 2010. The Ambassador his Excellency Mr. Zhao Jun hosted the Journalists to mark 18 years of the Diplomatic relations between Israel and China. Ambassador Zhao welcomed all the guests to his home and blessed them in Hebrew. 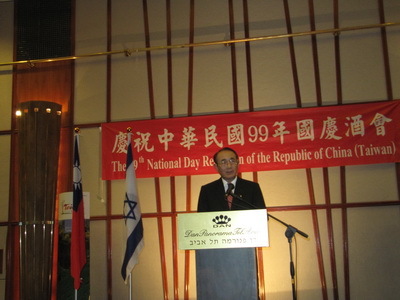 Ambassador Zhao spoke in English of the special relations between The People's Republic of China and Israel. Germany celebrated its 20th anniversary to the unification of east and west to one Federal Republic. 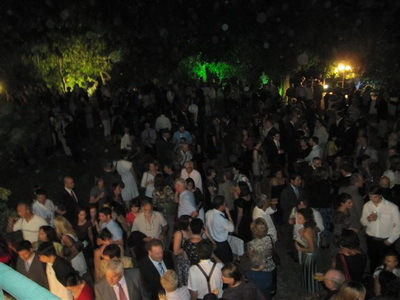 The German Embassy hosted many of the German community in Israel, Ambassadors, Diplomats, business man and others to a party at the residence of the German Ambassador to Israel, Dr. Harald Kindermann. 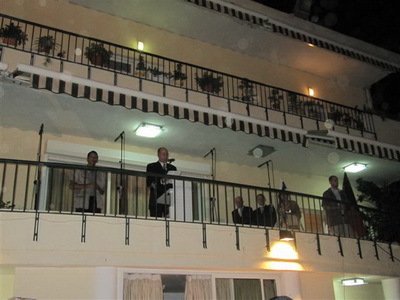 Ambassador Dr. Kindermann welcomed the crowd to the celebration to mark 20 years to a united Germany. Dr. Kindermann spoke about the relationship between Israel and Germany and called them excellent and fruitful. He mentioned the great improvement of the friendship of the two countries and wished a continuation of that road. Ambassador Dr. Kindermann couldn't help of mentioning the dark era of the German and Jewish people and said that the Nazis almost annihilated all Jewish life in Germany and the ones who could, for obvious reasons, left Germany. But now, the Jewish Community in Germany is flourishing while keeping its own identity as the pressure for assimilation no longer exists. After the Ambassador's speech, the representative of the Israeli Government, the vice prime minister and minister of strategic affairs, Mr. Moshe Ya'alon, took the stage. Mr. Ya'alon thanked Ambassador Dr. Kindermann for his hospitality. He spoke about the special connection between the state of Israel and the Federal Republic of Germany. He said that he remember the falling of the Berlin wall, 20 years ago, a brief moment in the clock of history but the changes happened in Germany and Europe were vast. Mr. Ya'alon mentioned that Germany stand alongside Israel and is concerned about Israel's security challenges, specially the Nuclearization of Iran. Mr. 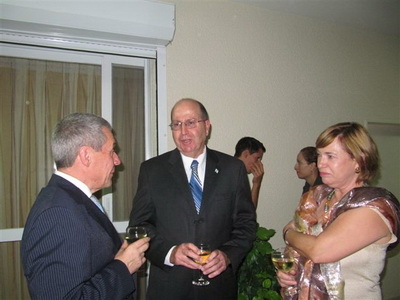 Ya'alon said that he hopes that the friendship between both states will continue to develop and grow. The special guest of the occasion was Mr. Wilhelm Hass, who was the Ambassador of Germany to Israel in the years 1985-1990. Mr. Haas shared with the present memories from the time of the early 1990's and the long way that the relationship between Israel and Germany had came. Mr. Haas ended his speech with a few sentences in Hebrew and wished the crowd all the best. The Country of Brazil celebrated its national day on September 7th. 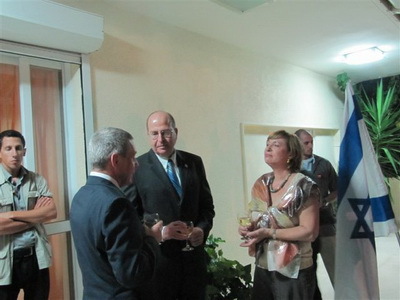 The Embassy of Brazil in Israel marked the occasion with an event in the Ambassador's residence in Herzeliya Pituah. The event combined the Jewish new year in the celebration. Ambassador Ms. Maria Elisa Berenguer welcomed the guests accompanied by consuls, military and economic attaches, and other respectable representatives. A Brazilian band played lovely typical music from brazil to the enjoyment of the present who were delighted of the tasty food and beverages straight from the homeland. 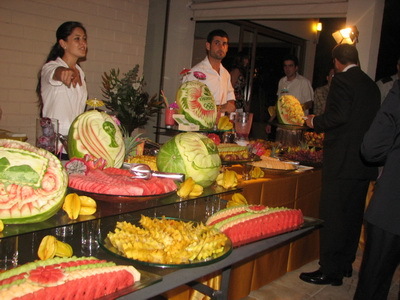 Another pearl of the event was the beautiful design of the fruits in the cocktail table. Ambassador Berenguer was the first speaker of the evening. She thanked all the guests in English and Hebrew for coming, and welcomed them to her home. Ambassador Berenguer started by saying that she is very excited to serve in the holy land and looking forward to working in Israel. Ms. Berenguer spoke of the Brazilian history and the Jewish history. 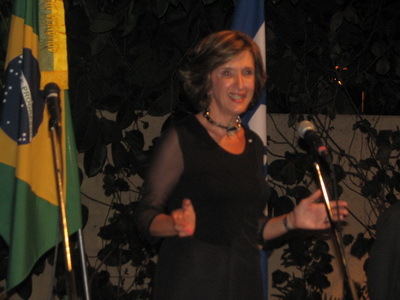 Ambassador Berenguer mentioned that Israel and Brazil hold a great deal of economic relations and cooperation. The Ambassador expressed her appreciation for the ability of Israel to succeed despite the challenges of size and security. Ms. Berenguer wished that this success will continue and grow. Ambassador Berenguer ended her speech with a happy new Jewish year wish to everyone ("Shana Tova") and welcomed Mr. Binyamin Ben Eliezer, Israel's minister of industry and trade. Mr. Ben Eliezer thanked Ambassador Berenguer for her hospitality and wished her a productive and enjoyable stay in Israel, Mr. Ben Eliezer added that he is sure that Ambassador Berenguer will quickly feel here at home. Mr. Ben Eliezer spoke of Brazil as an economic superpower that keeps growing with time, he said that Israel should be proud of the vast economic cooperation between the countries. After the speeches both of the anthems were played and afterwards the guests were free to mingle as the Ambassador Ms. Berenguer took pictures with the guests who wished.